What’s that smell in the air? Crisp, fresh, and a little plasticy—it must be IFA season. That’s right, the 2017 iteration of Berlin’s annual technology trade show is almost upon us, and we at Mila have collected all the juiciest IFA gossip and rumors into one place. Read on to see our preview for IFA 2017! 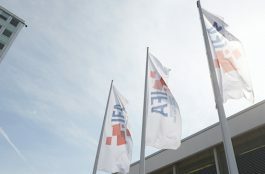 IFA 2017 will take place from September 1-6 at Messe Berlin, a retrofuturist convention hall in the western part of the city. Product launches will mostly take place a few days before to ensure that everyone gets a chance to see the new products during the trade show’s frantic 5-day duration. The IFA—Internationale Funkausstellung Berlin—is Germany’s premier tech trade show, a place where tech manufacturers, retailers, and journalists converge to see what the new hotness is. This year, IFA is joined by industry giants like Sony, Samsung, and LG as well as the normal assortment of American and European firms. Here’s what to expect. Philips has been hinting on a new connected toothbrush, but visitors can definitely expect an update to the successful Hue connected lighting equipment. Their smart speakers (called Fidelio), and maybe we can even look forward to a new TV concept like the Ambilux UHD TV from a few years back. An old IFA attendant, Sony usually premiers phones and home audio at Berlin’s tech conference. Expect to see updates to the Xperia line of smartphones and a new bluetooth headphone set. Laptops, laptops, laptops. Last year, Acer, consistently the most creative and experimental home computing brand, launched their humongous Predator gaming laptop (weighing almost 8 kilos!). Will they launch an even larger “laptop?” We hope not. But expect to see a selection of new chromebooks, laptops, and tablets. Samsung has just announced the Galaxy Note 8, so a new phone probably isn’t in the works. Instead, look out for Samsung to introduce a new smartwatch and / or a new high tech appliance (2015’s Addwash washing machine comes to mind). A new tablet is also likely to make an appearance at the Samsung booth. Samsung will also begin offering its Swiss customers on-demand home assistance when they upgrade to a new smartphone, including contacts transfer and more, with Mila leading the way by linking Samsung customers with competent local experts. HTC is likely to continue to relax from the smartphone game, so expect them to give us updates on their successful VR division. HTC is currently working on two standalone VR headsets, so it’s safe to bet we’ll see some information about those. The other Korean giant is expected to reveal a new smartphone probably called the V30, successor to last year’s V20. LG also recently previewed a mysterious “Hub Robot,” a sort of Alexa-like assistant for the smart home. Visitors to IFA can expect to get some more information about this enigmatic android. Motorola is likely to continue with their successful Moto Z phone line, while the laptop side called Lenovo seems primed to release a folding laptop/tablet combo successor to their Yoga from last year. What else to expect at IFA 2017? Your guess is as good as ours! Aside from the more obvious predictions, there are always a few long shots and surprise reveals at IFA, so we might just have to wait and see. The only way to know for sure? Be there!